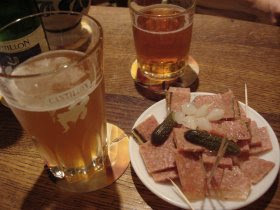 Thirsty Pilgrim: Mysterious Belgian Bar Snacks, Part I: Kip-Kap. (1) Good pubs don't necessarily need to serve food, but it helps. (2) Good pubs without food are rare but still exist. (3) Serving no food at all is nothing to brag about. All of this has me thinking about the drinking cultures of other countries. And to what extent they include eating as part of the picture. 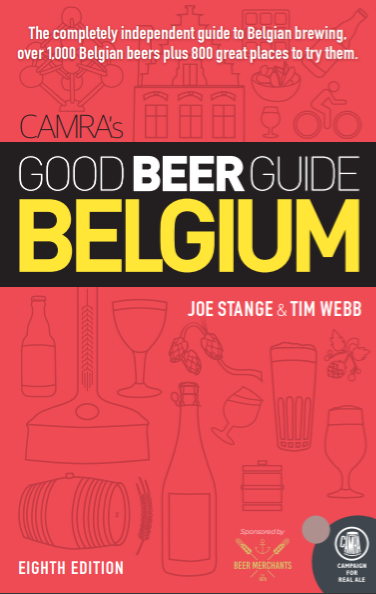 Originally I vomited up hundreds of words about the importance of food to pubs in the U.S., Germany and Belgium. I'll sum it up with a rhetorical question (which means I don't really want you to answer): If you care about either good beer or good food, then why don't you care about both? Because beer is food and vice versa. Then I deleted it all, because none of it was as interesting as the mystery of kip-kap. Kip-kap is a local bar snack common in Brussels and surrounding areas. It's a sort of lunchmeat made from, allegedly, pig cheeks suspended in gelatin. Tastier than it sounds, especially with a glass of bottled lambic (pictured here next to some Cantillon Oude Gueuze at the Bécasse café). The gelatin has a faintly lemony taste that gets along with the sour beer, whose natural carbonation sweeps the meat's salt and fattiness away. Something like that. OK, I'm sure it's not for everyone. But is that really pig cheek in there, or are other organs involved? How is it processed? Who came up with this? Most importantly, why? On second thought, I don't want to know. The mystery is part of the adventure. I'm not sure we could handle the truth anyhow. Written over a Faro glass and a plate of kip kap in "la mort subite" in bruxelles; who cares? It is good!